When attention-deficit hyperactivity disorder (ADHD) is a part of your life, you know stress. ADHD always presents in childhood even if symptoms are not recognized at the time. ADHD may have negatively affected you in school because the inattention and hyperactivity made it nearly impossible to get good grades, and the teachers never fully appreciated your antics. The teachers were not alone as many of your friends quickly grew tired of your endless energy or hyperfocus on video games rather than going outside. Home life was also difficult because it seemed that your parents were always yelling at you because you forgot to take out the garbage. Meanwhile, you never remembered them telling you in the first place. As you aged, you hoped that you would “grow out” of your ADHD symptoms. After all, people in your life always told you that would be the case. Somehow magically on your eighteenth birthday, the ADHD symptoms would just fly out of your body leaving you forever. Unfortunately, this concept never materialized and the kid with ADHD became the adult with ADHD. Adult ADHD symptoms present in somewhat different ways from childhood, but one thing remains constant: stress. Perhaps as a child, you never quite found the right combination of coping skills to reduce stress. Maybe you did, but the transition into adulthood triggered new or re-energized symptoms to emerge that your former coping skills could not manage. In either case, stress is back in your life. What are you going to do about it? Are you going to escape into the world of video games or take a stand against ADHD-related stress? Read on to fight back. In order to cope with stress, you’ll need to add or learn some coping and managing tools in order to deal with it when the time comes. Below are seven ADHD and stress coping skills you can implement today. Relaxation does not just come along one day and introduce itself. You have to seek it out. You have to chase after it to make it part of your life. If it sounds like work, it is, but the payout is the calm that every person with ADHD desires. The calm will extend from your body to your mind and back again. If relaxation has not worked for you in the past, avoid the tendency to blame the relaxation and look at yourself. Did you practice as often as you could have? Did you set aside the time needed to be successful? Did you fully buy into the idea of relaxation being helpful? Therapists teach many relaxation routines that focus on deep breathing, imagining that you are in a peaceful place and putting positive thoughts into your mind. These skills work wonders for many people. Relaxation can come from less technical sources like spending time with friends or putting on your favorite song during the drive home. Making time for relaxation will push the stress out of your life. People with ADHD do not usually have sleeping problems directly associated with the diagnosis like people with depression or bipolar do, but sleep can still be a barrier. If you are on a stimulant medication and sleep is poor, consider the interaction. Some stimulants at higher doses can make sleep hard to achieve since your body is still activated. Bring this information to your prescriber to talk options. ADHD medications are numerous. There is a better fit out there for you. People with ADHD can often experience poor sleep due to going to bed too late. Often you may become involved with a new project or activity and completely lose track of time. A five-minute task turns into a two-hour distraction. Avoid this by knowing your habits and tendencies. If you are ready to start something new late at night, catch yourself and drag yourself to bed. Getting rest will ensure you are on top of your game since being overly tired can mirror ADHD symptoms and trigger stress. Think about being in school. What do you have to do? Sit still. Pay attention. Keep quiet. Raise your hand before speaking. Perform well on the test based on the information you couldn’t pay attention to in the first place. Sounds like a recipe for disaster, and for you, it probably was. 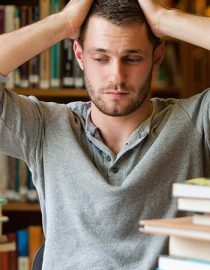 People with ADHD perform better at school and work when they have an opportunity to burn off the excess energy that has been collecting throughout the day. Exercise extends beyond running a 5k or going to the gym. If you have ADHD, some of the best exercise you can do is getting up from your desk at work every 30 minutes or going for a walk at lunchtime. Schools are built to smother ADHD symptoms but only make them worse. Acknowledge and embrace your ADHD while using it to improve your physical health. Exercise will decrease stress directly by putting some wanted chemicals in your brain and indirectly by reducing your ADHD symptoms that contribute to stress. Next page: More ways to tackle ADHD and stress.